Your Home for the Montana Cribbage Open! See the banner to the right to register today! It's as easy as 15 for 2! Please only register one player per message. Your registration will be confirmed via reply email or by phone. The Bozeman Cribbage Club meets every Tuesday night for a 5-game round robin tournament. $8 to enter and lots of good fun, good company, and good times! 100% pay-out. Sign up starts at 6 and cards are in the air at 6:30! 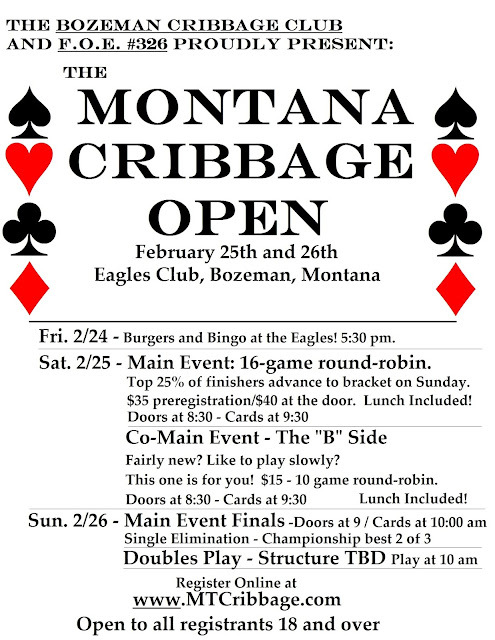 Also, please check out the Bozeman Cribbage Club on Facebook and give us a like and a share. The more the merrier! The Facebook page can be found HERE or at Facebook.com/BozemanCribbageClub.